Timber Piling Contractor, Timber piling Replacement. Timber Pilings are no longer the most cost effective Deep Foundation System for new construction on the market today. 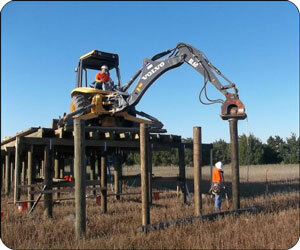 Timber Piles (or wood piles) have been installed for deep foundation system for centuries. Foundation Masters, LLC Engineers, designs and installs all piling types, if you are looking for the most cost effective Deep Foundation System then our Steel Pilings are the BEST and the Smallest pile we use has been field tested and failed at 118 kips that’s 5 x STRONGER than a Timber Piling, and they are very close in price. another very attractive side to pipe pilings is we provide a lifetime transferable warranty with all pipe pile projects. Timber pilings that are used in new construction typical run $650.00+ per pile depending on timber pile size. There are contractor that will give a lower bid but they leave out key items, basically you don’t have a finished pile. Timber Pilings that are exposed to oxygen will rot, dissolve, become soft and allow wood destroying insets and organisms to damage the pile. The method of installation of Timber Pilings is know to cause construction vibration damage to the neighboring structures, resulting in expensive litigation. Timber pilings will allow future settlement to take place and the timber pile does not come with any type of warranty leaving the homeowner with a expensive repair. Steel Pilings will never fail for the simple reason they are driven to limestone. 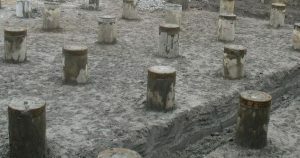 The method of installation of Steel Pilings will not cause construction vibration damage to the neighboring structures, Foundation Masters LLC equipment has been tested by Hillsborough County Engineers, in reference to a project we completed that involved 15 homes with concern of construction vibration damage. Steel pilings come with a Life Time Transferable Warranty. This warranty alone make the steel piling the better option for the simple reason of property value and resale value. This is very important to a builder that wants to sell there homes fast and the homeowner that wants protection in a sinkhole prone State. To install a Timber Piling, you have to use a drop, impact (hydraulic, pneumatic, diesel) and/or vibratory hammer in which all can cause, Construction Vibration Damage to neighboring structures, from piling installation. This will put the homeowner, Engineer and your company at risk of legal action. Foundation Masters, LLC specializes in Construction Vibration Damage and handles around 10-12 of these cases a year. If you are using Timber Pilings then have your contractor take GOOD pics of the neighboring homes/structures, and set up vibration monitoring equipment. The best way to go is contact us for a FREE construction site evaluation and/or design a different piling system. Foundation Masters, LLC specializes in theses types of claims and will protect you ‘our client’ from any chances of legal damages do to construction vibration damages. Foundation Masters, LLC will visually inspect any neighboring structures and record every crack pastern that may exist. Vibration monitoring systems will be used. Foundation Masters, LLC will make it very difficult for any adjacent property owner to claim construction vibration damage. We setup monitoring equipment to help protect our clients from incurring damage claims from levels of ground motion/vibration when a potentially aggressive construction or demolition project is planned to occur.